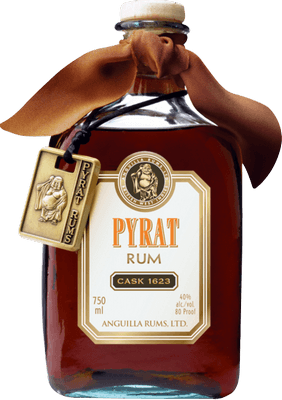 Have you found an online vendor selling Pyrat Cask 1623? Nevermind that the price point for this is Ridiculous with a capital R. The additive orange and almond flavors do not dramatically distinguish it from the XO product, which to me is equally insulting to good rum everywhere. I deem this "not rum." I would never spend this much on a bottle no matter what it is. But while on vacation in the BVI's I got to have a taste of it at a tasting bar. It was smooth but tasted like an orange liquor. It tasted nothing like rum, so what's the point. Good. A sweeter slightly less orangey taste than the Pyrat XO. The flavors linger in the nose and pallet but there is no way to justify the price. Frankly the XO is every bit as good for a fraction of the price. Nice to try. Once. Much like the Black Tot, the Cask 1623 is a very special treat, that requires you to face the high price before getting the experience of the drink. It is clearly a much better beverage than most, complex and multi-layered in flavour with an aroma that lingers for minutes. I would not, however, necessarily buy this for myself. It's compared to the Pyrat XO the perfect balance of the orange flavour. It is very smooth and oily to sip and the age of up to 40 years makes this rum to a very long lasting joy. It's quite an expensive price for a rum where you don't know exactly the percentage of rum that really has been aged for 40 years of this bottle. One would assume that with the growing demand of rum, the percentage of long aged rum will decrease and younger aged rums will take over. love it. A great treat. Love to sip and watch the sun go down. This is (at the moment) the best rum I have tasted. It has it all: rich flavors, long aftertaste and enough sugar to satisfy my sweet taste. It is also the most expensive rum i have bought - and for the price I should not give it a 10 but an 8 maybe. It has the same orange flavor as the Pyrat XO Rum. But is much richer, witch you should expect at 5 times the price. overpriced? maby - excelent yes! I received this as a gift from a vendor. I only will have a sip on occasion to make it last longer. (ok a few fingers) It's a tasty rum but wayyy over priced. I certainly would not buy this for myself. It has great favor, smooth taste and amazing finish. If you can still find this rum it is recommended that you try it. It is one of my top Sipping Rums. Amazing! I hear the haters hating but what is there to hate about something with such a long ever developing levels of flavor. Smell it! Mmmmmmhh. Taste it! Roll it around in your mouth and realize how many layer of flavor there are with no off-putting alcohol bite. Swallow it, again no burn, just a nice sweet warm sensation as the flavors continue to develop long after its left your mouth. I leave the cork out of an empty bottle and allow it to permeate my house with its yummy bakeshop aroma for days reminding me of just how yummy it is. The price? Yeah its about double what it should cost but I can't resist. This is a decisive Rum, love or Hate. It’s not really all about price. Many people are willing to spend much more on whiskeys than we see in the rum world. This “Rum” is far superior to Zacapa Centanario XO and probably should be for the price. If all you want is a mixing rum then skip this one. If you want a truly fantastic Rum based flavor experience then this is one for the cabinet. Strong Orange from the Grand Marnier casks, more than expected even but lots of additional flavor beneath it. Caramel, chocolate, fruit, sweet and delicious. I’d buy this every time over Johnny Walker Blue and I am a whiskey fan. OK I would classify this as a liqueur more than your standard rum as it sweet with a lot of orange chocolate flavours. Now at $250 per bottle it is a great "Rum" but I would not pay this amount for any liqueur. I have it now so It will be doled out in a liqueur glass not in my Glencarin spirit glasses. If you are looking for a great Rum look no further, this is it!!!! This rum is so good but is tough to find where I live. Delicious! Best rum ever. Soooo smooth. No burning. Special unique tastes. Hard to describe maybe a hint of fruity? I was looking for the Pyrat Cask 1623 for well over 3 years since it is a rare bottle here in the US, but finally I found one and what a disappointment. Tried the Cask 1623 before the Pyrat XO and it is slightly better in my mind, but then again the very strong and off putting orange scent is still prevalent on the Cask 1623. Not worth the price in my opinion.